Ravages Of Heroin Addiction Haunt Friends, Families And Whole Towns Deaths from heroin nearly tripled between 2010 and 2013, and demand for the drug isn't dropping. Towns across the U.S. are grappling with the deadly epidemic — including a once-idyllic town in Ohio. A water tower in Marion, Ohio. The city has been gripped by heroin addition. Marion, Ohio, just north of Columbus, used to be an idyllic place to grow up. Kelly Clixby and Beth Carey remember what it was like a generation ago, when they were young. "I lived across the street from one of the big parks here," Clixby says. "We would rip n' run all day and all night and come in when the street lights were on." "It was just a nice place to live," Carey says. Today, Marion is different. It's grappling with a full-blown heroin epidemic, one that derailed Kelly Clixby's life and killed Beth Carey's twin sister. This week on For The Record: one small town copes with the ravages of addiction. A street in downtown Marion, Ohio. The former Grand Opera House is now the Elks Lodge, which is supporting drug awareness programs within the community. Deaths from heroin have been skyrocketing over the last few years — among all age groups, across all races and in all regions of the U.S. 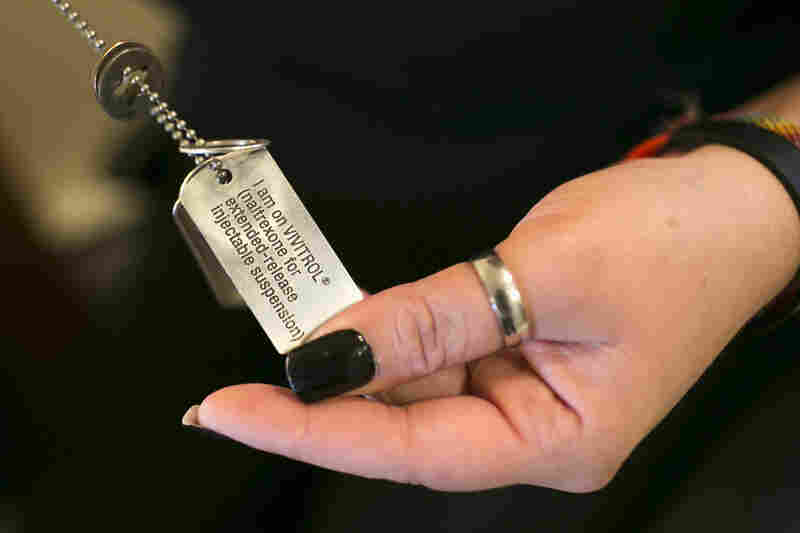 According to a recent study by the Centers for Disease Control, more than 8,000 Americans died of heroin-related overdoses in 2013 — nearly three times as many as died in 2010. But the risk hasn't dented demand. Heroin is cheap, abundant and accessible, and communities across the nation, from big cities to small rural towns, are struggling with the consequences. 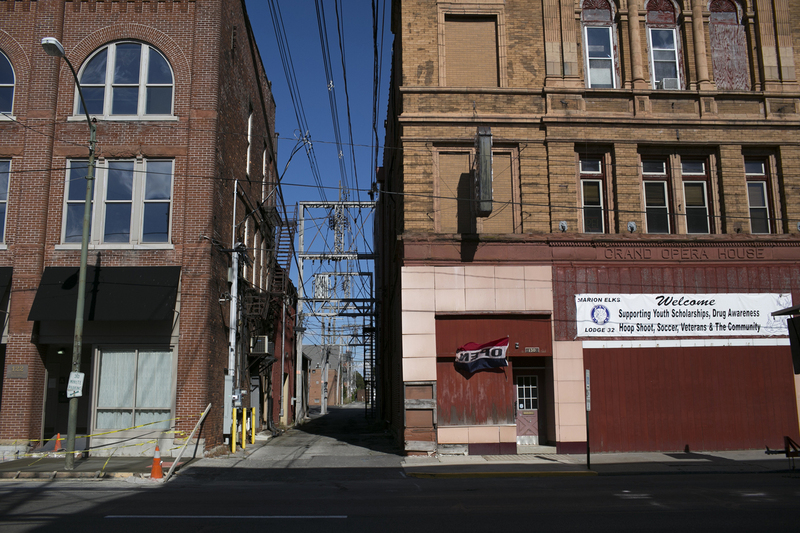 In Marion, Ohio — once a thriving steel town — the trouble arrived around 2007, when the police started seeing balloons of heroin during routine traffic stops. Since then, heroin has changed many lives in Marion. It took Chrystina Carey's. 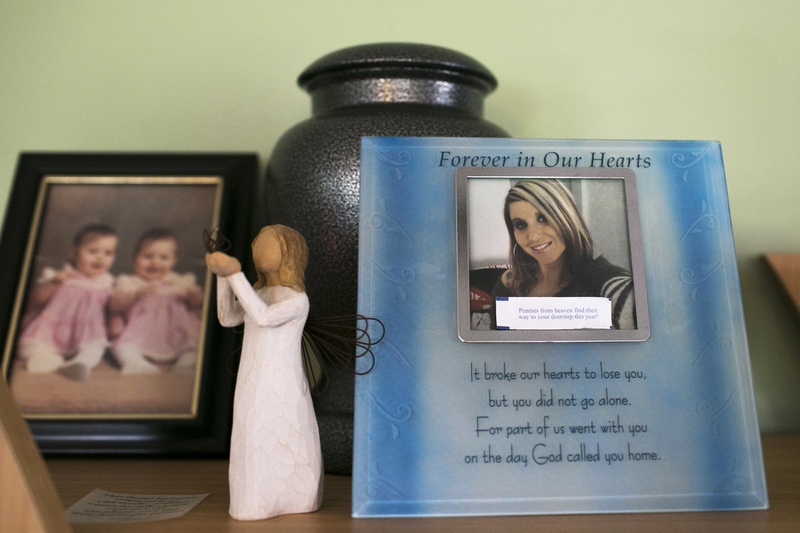 Photos and an urn of ashes to remember Chrystina Carey, Beth Carey's twin sister who died of a drug overdose in 2013, sit in her home in Marion. Beth Carey had started worrying about her sister when they were in their early 20s. At that point, Chrystina was hanging around a different crowd than her twin, taking ecstasy while working as a dietary manager. "She was on call all the time," Beth Carey says. "She said, about the ecstasy ... she was taking it to stay up when we would go out on the weekends." At some point, Chrystina switched from ecstasy to the painkiller OxyContin — and then, eventually, to heroin. "She OD'd and went to the hospital three times," Beth Carey says. "Out of the six or seven years [she was on heroin], she was probably incarcerated a good two, 2 1/2 years. "But still continued to use drugs." The last time Chrystina Carey got out of prison, she went to stay at an addiction recovery house in the next town over. Kelly Clixby was living there, too, grappling with an addiction that began with prescribed painkillers and led to heroin. She knew Chrystina well. "That was my best friend," she says. Clixby remembers the night before Chrystina Carey died. She was heading out with someone known to be wrapped up in drugs and Kelly was worried. "I said, 'If you leave with that person, you're probably going to die tonight.' And I was being sarcastic ... by no means did I mean it. "And she left. And at 8 o'clock the next morning I woke up to a phone call that she had died. She had overdosed, after seven months of sobriety." Witnessing the death of her friend had a profound impact on Clixby's own sobriety. "It terrified me," she says. "For a long time after that I stayed clean just ... so I wouldn't disrespect her, or so her death wouldn't be in vain." 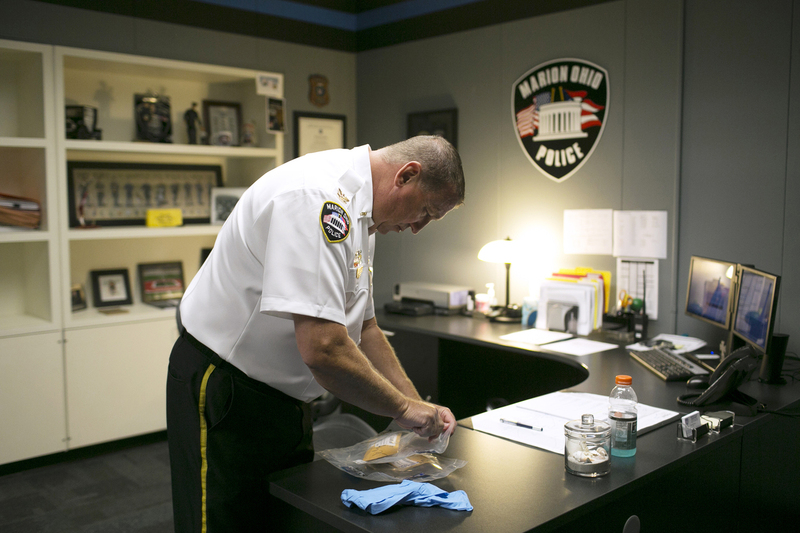 Police Chief Bill Collins inspects confiscated crack cocaine and brown powder heroin in Marion. Marion Police Chief Bill Collins has witnessed many overdoses like the one that killed Chrystina Carey. Back in May of this year, he said his team was responding to as many as two or three in a single hour. "You walk in and you know, you see somebody that's blue. I mean, to you they appear to be dead," he says. Then the officers would administer a drug called Narcan. "It's like a miracle drug," Collins says. "Within 30 seconds they snap out of it. They wake up. They look at you like they don't know what happened." Collins would tell survivors how lucky they were to be alive, how close they came to death. "We would get called to the same house and people had just seen somebody overdose and they would still do it," he says. Confiscated brown powder heroin (left) and confiscated crack cocaine are shown in Police Chief Bill Collins' office in Marion. Collins remembers several years ago when all he had to worry about in Marion was crack cocaine. And at least crack addicts, he says, could somehow hold a life together. It's a different story with heroin users, he says. "These people are not able to hold a job," he says. "They steal their family blind to the point where the family just pretty much disowns them. "It doesn't take long for you to end up seeing a heroin addict that has burnt every bridge they've ever had." The drug is the root cause for many of the other problems his department faces, he says. "All of the property crimes we have — the shoplifting, the thefts, the robberies — all go back to one thing, and that's heroin." Narcan can save the lives of heroin users on the brink of death, but another drug, Vivitrol, helps addicts avoid getting there in the first place. 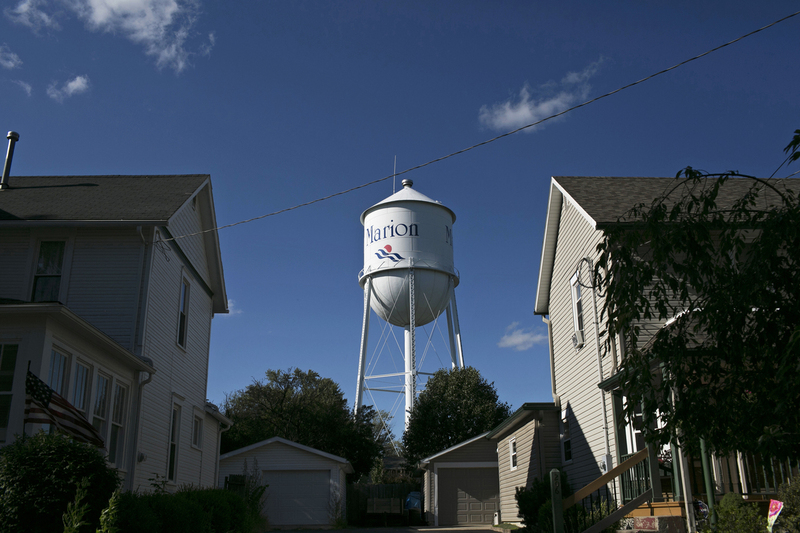 Vivitrol is a big reason Marion has been able to get some sort of grip on its heroin epidemic. The drug is an extended-release opiate blocker. Kelly Clixby, Chrystina Carey's friend and a recovering heroin addict, explains how it works. Kelly Clixby stands outside of her home in Marion. Kelly is a recovering addict who was been clean since last October. "I get a shot every four weeks and what it does is it sits on the opioid receptors in the brain," she says. "And if I were to use heroin or an opiate, it wouldn't be able to attach to that receptor, so I wouldn't get high — so it's basically a waste of time." It's a powerful tool for helping addicts keep from relapsing, but Clixby is clear about its limits. "A lot of people think it's a cure-all," Clixby says. "It's not." Kelly Clixby wears a necklace saying she is on Vivitrol, which is a prescription drug that helps former drug users stay off of opiates. And, because Vivitrol only blocks the effects of opiates like heroin, Collins says addicts dead set on getting high are looking elsewhere. "We've seen a pretty big increase back into the crack cocaine market, because they can be on probation and be on the Vivitrol shot and still use crack cocaine and get high," he says. "So they're still feeding their addiction: They've just switched to something different again." It's been almost eight years since heroin showed up in Marion, Ohio. Since then, Chief Collins says public awareness campaigns have helped with the problem, and more funding for drugs like Narcan and Vivitrol has saved lives. A couple of months ago his department brought down a major drug dealer. They're not the aunt or uncle or daughter or son or sister that you used to know. They're a shell of a person that used to be great. "You feel like you're in the ocean without a life jacket," he says. "And I at least feel like I have a life jacket on now." After years of fighting her own heroin addiction, Kelly Clixby's life is on more stable footing. She's got her own apartment. She's regained custody of one of her five kids and she is working on her second marriage, although her husband is still battling his own addiction. "I've really learned just to stay on my track and just keep trudging forward despite what he's doing," she says. "If he uses, I can't, no matter what." And Beth Carey, for her part, thinks about her twin sister every day. Chrystina Carey left behind two daughters. One is now 15 years old and lives with Beth's grandmother. Beth is raising the younger girl — Jazlen, age 3. 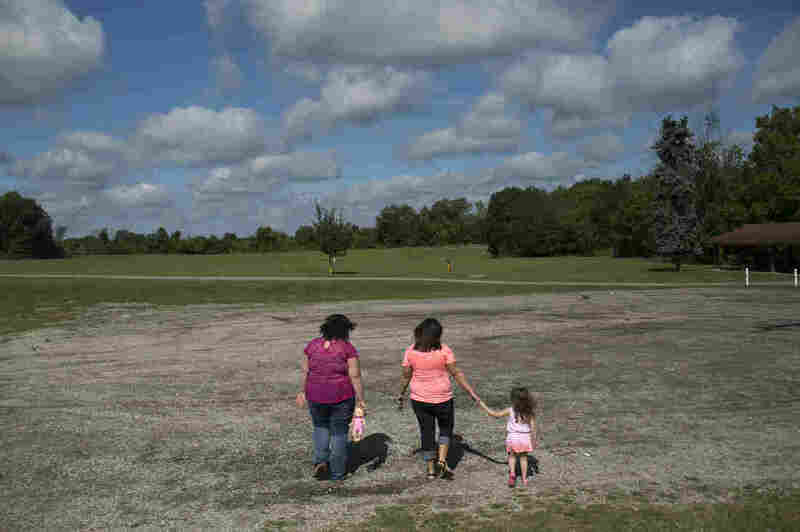 Beth Carey (right) stands in the park with her nieces Jazlen Harden, 3, and Calysta Dildine, 15, in Marion. Chrystina, Beth's twin sister and Jazlen and Calysta's mother, died of a drug overdose in February of 2013. She calls Beth Carey "Mommy." "When I first got her ... I was letting her call me Aunt Beth," Carey says. "And then after a while, she was going to daycare, and she would hear other people cry out for mommy. So she started calling everyone mommy, cause she didn't understand what that meant. "And I knew that she needed to associate that word with someone." Beth Carey is trying to look forward, but it's hard when so many other families in her community are also suffering the effects of heroin. Sometimes loved ones die, like her sister, and other times they just slip away. Beth Carey (center), walks around the park with her nieces Calysta Dildine, 15, and Jazlen Harden, 3, in Marion. Chrystina, Beth's twin sister and Jazlen and Calysta's mother, died of a drug overdose in February of 2013. "They're just zombies at this point. They're just on a mission and lying and stealing and manipulating and cheating," she says. "They're not the aunt or uncle or daughter or son or sister that you used to know. They're a shell of a person that used to be great."